I recently joined a panel of experienced colleagues in an engaging group discussion of the role site visits play in philanthropy and how best to structure them to achieve maximum benefit. Today, Exponent Philanthropy released a related video, the final in its 9-part Philanthropy Lessons series. Philanthropy Lessons: Getting Out of the Office explores site visits as ways for funders and grantees to learn from one another with mutual respect and transparency. Learning about issues—The opportunity to get out of the office for an “in the field” discussion of big picture problems and sustainable solutions is a valuable way to inform grantmaking. Nonprofit leaders are experts in their work and are often available to be tapped to help you learn about the issues. I’ve experienced this professionally as well as personally: Handing out food at a local food pantry and interacting with food insecure residents of my town changed how I think about the demographics of hunger in way that reading an article or a study never would. Considering a grant—A site visit will let you kick the tires, meet the staff, observe an executive director or program director in action, and gain a better understanding of an organization’s evolution and current strengths and weaknesses. Since 90% of communication is non-verbal, site visits provide a valuable opportunity to observe many intangibles that reflect the leadership, community, and culture of an organization. If they have submitted a proposal, this is a great chance to ask detailed questions and get unscripted responses. Responding to red flags—When things aren’t going well with a grant, a site visit can help you quickly get to the bottom of things. Executive director was fired or left suddenly? Several board members quit at once? Financial crisis? When an organization is in flux, the success of your grant is at risk. Get out there and meet with the staff and the board chair; ask hard questions; and be prepared to work with the organization to recast the grant. I’ve adjusted the terms of a grant midstream, provided extensions, and shifted funding to newly founded organizations after a split; all of these were hashed out after meeting in person to address challenges and move forward. Professional development—Conferences and networking events are great, but a site visit can provide valuable and memorable learning. I’ll never forget walking among rows of farmworkers bent over furiously picking strawberries in the sweltering California sun; nor will I forget the dam removal in Maine or the abattoir in North Carolina. Occasional immersion in the world where my grantees work is an essential component to keep me grounded in reality. Holding feet to fire—Sometimes you need to remind a grantee you are monitoring their progress and holding them accountable to the objectives of the proposal you funded. A mid-grant site visit provides an opportunity to review goals and metrics together, and can help keep things on track. Board engagement and development—We all want trustees on our board who understand the issues we are working on, who think strategically about making an impact, and who are inspired by their role in philanthropy. A site visit can open a board member’s eyes to the reality of the work, connect them to the issues on a personal level, and give them stories to report back to friends, family, and the rest of the board. Reassuring your board—Reporting back to a donor or trustee with direct observations and being able to say ‘I’ve been to their office, I’ve met their staff’ shows your deep engagement with the grantee. When staff or board members gain a nuanced understanding of the work and have personal experiences via site visits, it translates into more compelling write-ups and presentations, deeper relationships with grantees, and a sense of the value and importance of the work. 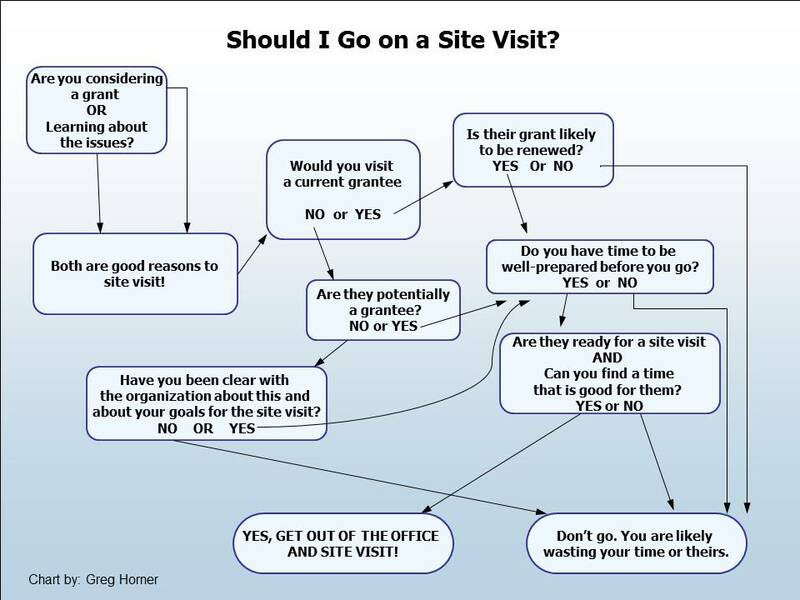 As valuable as site visits can be, they aren’t always appropriate. Think carefully about your objectives and goals before proceeding into the field: What is the site visit going to add to your understanding of the grantee and their work? What do you want to see/discuss on the visit and why? What are you going to do with the information? Having an unclear purpose and a vague notion of the expected outcome is not setting yourself up for success on a site visit. A grant is unlikely to be renewed. Don’t waste their time or yours on a site visit. Focus your efforts for relationships with a future. The grantee isn’t ready for it. If your timing doesn’t line up with a good time for a grantee, don’t force it. Given the inherent power dynamic and the potential benefit for a grantee, it will be hard for them to say no to a site visit request. But if it is the day before their big annual meeting or other event, you will be detracting from their work and they won’t be well prepared or fully present. Be sure to set a time that works well for all, and find a time when you can meet with all the key staff. Bonus reason to site visit: To inspire us. Without inspiration and passion for our work, our jobs can lose their luster. Site visits are not a cure-all, but when staff and board get out of the office, away from email and dry proposals, and into the field for real experiences, we all benefit: Staff are reminded of the value of their efforts; board members gain context for their decision making; grantees have a chance to show off their work; and barriers break down as we remember that we need each other for philanthropy to have any impact. Greg Horner is a Senior Program Officer at the Cedar Tree Foundation in Boston. He focuses on environmental grantmaking, including sustainable agriculture & food systems, environmental education, and climate change. He holds a Master’s Degree in Natural Resources Policy & Behavior from the University of Michigan. He lives on the North Shore of Massachusetts with his family. Thanks for your insights, Greg! We just had an excellent site visit training experience as part of the Next Gen Fellows program, and much of what you said here certainly resonates.